After a decade plus of constant performing the one and only viAgro are still up for the usual post gig question, "How the f**k do you do that?" "We still get asked that every night, along with the various viagra jokes and numerous theories and opinions on why we havent got a drummer" says co-founder Palzy Daivah. 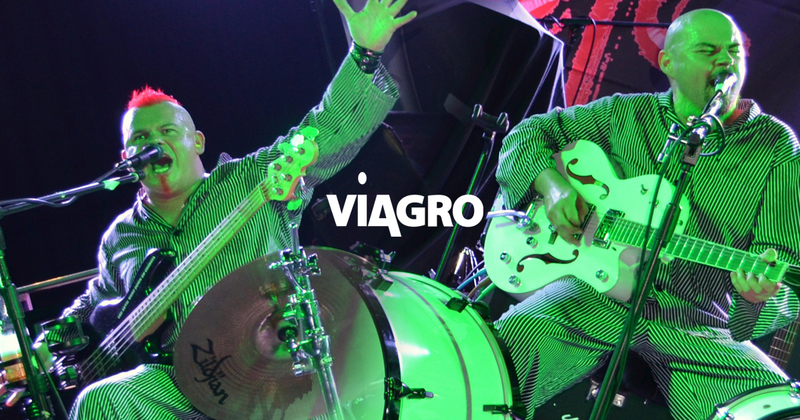 For the uneducated, viAgro are a duo of brothers that divide a drum kit between its two members whilst singing and playing guitars at the same time. The end result being a full sounding rock band show cleverly pulled off by only 2 people. With a heavily revamped repertoire of classic songs spanning over 6 decades of rock and a few tunes from their 2010 debut EP Sucker for a licker, you get a very entertaining, unique and highly energetic show. "A lot of bands lay claim to being different but over our 10 year existence weve yet to come across or even hear of another band that does what, looks or sounds like we do." continues Palzy. Within the 1500 + shows performed viAgro have also supported The Screaming Jets and toured with The Angels on their 2014 40th Anniversary tour. ViAgro, abusing covers like no others.